Look Out! Here Comes the SpiderBaby! An interview with Terrance Griep, Jr. In the last few months, the Midwestern Indy scene has been getting more and more notice. With the WWE and TNA scouting for more new stars, and the emergence of several potential future champions, the Mid-West looks to be on the verge of exploding. Midwest Pro Wrestling has been getting a lot of press in particular, specifically for the wrestler SpiderBaby. Terrance Griep plays SpiderBaby, the first wrestler to be openly gay both behind the scenes and to the audience. 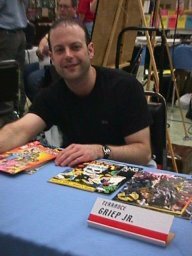 For comics fans, however, Griep also has another dream job: he writes Scooby Doo for DC Comics. Griep has a feature on his wrestling career in the current Out Magazine and was kind enough to answer a few of my questions. Christopher J. Garcia: You’re livin’ the Fanboy dream by writing comics and wrestling at the same time. Terrance Griep: It’s very, very hard work, but I’m deeply grateful for and humbled by the opportunity. CG: Where do you see the intersection of these two worlds? TG: Well, I’m sure the heelish SpiderBaby would note the parallel between the two fandoms as one of questionable hygienic skill, but that’s HIS opinion, not mine! Seriously, current WWE superstars almost uniformly mention that they read super-hero comics as kids, and they fell in love with pro wrestling for many of the same reasons: larger-than-life characters telling the story of good versus evil. I think another parallel between comics and wrestling is that both are generally maligned by the outside world and, not coincidentally, misunderstood. I think both have grown up tremendously in the last twenty years. I bring my writing experience into each and every match which is, after all, a story. I hope my strength as a wrestler is bringing a sense of structure, pacing, and especially character between the ropes. CG: Do you think that telling a story in the context of a match is easier or harder than doing it in a series of panels? TG: I like the collaboration involved in both, but they’re generally hard to compare. I will tell you this, though: I’ve neither bloodied my nose nor cracked a rib writing…but I’ve done both while wrestling. CG: My Girlfriend’s 4-year old loves your Scooby-Doo stuff. CG: I’m fond of the fact that the comic has managed to retain the original feel but still feels fresh after 30 years. What are the difficulties in writing a title based on such a major part of our childhood mythos? TG: if I’m honest, I don’t find writing Scooby at all difficult. I just think about why I personally like the characters and situations so much, then I build my stories around those likes. 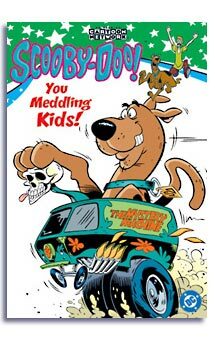 It’s easy for people to relate to how I relate to Scooby and his pals. Oftentimes, we all relate in the same way. In other words, I stop thinking of the characters as characters and start thinking of them as childhood friends. The stories just sort of flow from that point of reference. CG: You started out in wrestling doing commentary, which means you had to be a student of the sport. When did you start watching? Who influenced your style most, both in the ring and announcing? TG: I get asked this question often, and I answer it off-the-top-of-my-head-ish every time. I’m sure some comic book fan’s going to collate my answers and call me out for breaking my own continuity. I started watching as a five-year-old with my dad, who used me as his own personal, prepubescent jobber. He wisely died in 1996, sparing himself much painful karma. My influences? I worship the Rock. I love the actual wrestling of William Regal who makes ordinary holds extraordinary. Of late, I’ve studied numerous old tapes and discovered or rediscovered Jake Roberts, Eddie Gilbert, Bob Orton, Jr., Ray Stevens, Nick Bockwinkel, Arn Anderson, Buddy Rogers, Billy Graham, Pat Patterson, Art Barr, and Eddie Guerrero, to name only a few. Commentary-wise? Heenan, Piper, Cornette–another guy I worship–and especially Jesse “The Body” Ventura. CG: In the history of wrestling, there have been many openly gay wrestlers, Pat Patterson being the first to come to mind, though none have ever come out to the fans. TG: I’m glad you’ve made that distinction. This story has sort of outrun the reality. I’m certainly not claiming to be the first gay man in wrestling, and I hold Mister Patterson and the many others who’ve come before me in the highest esteem. I’m gay; I’m out; and I’m a pro wrestler. That’s all I personally am laying claim to–nothing more, and nothing less. CG: Do you think the fanbase in general is ready to accept an openly gay wrestler? TG: This sentiment has been expressed to me, in a dubious, what’re-you-nuts? kind of way, by some wrestlers. But here’s the truth: if they’re ready, then there’s really no point in being out, is there? That said, Midwest Pro Wrestling’s fans have really responded to my message: that is, boo The SpiderBaby for what he does, not who he is. And boo me they do! CG: What is the atmosphere in the dressing room? TG: It’s cool. Each wrestler there understands that my one and only priority is putting on a memorable show…just like his is. CG: How do you feel about characters like Exotic Adrian Street, Adorable Adrian Adonis, Goldust, and the West Hollywood Blondes? TG: I find them generally disturbing, particularly the more modern ones. It disturbs me to think that these are the first images of tacitly, yet flamboyantly, gay men that many teen boys — pro wrestling’s largest modern demographic — will see. And the reactions these characters garner from the fans certainly don’t leave me very optimistic about how these kids relate to LGBT people. And I cringe to think what a gay teenager who sees these characters must think and feel. CG: Do you see gay characters being more reasonably portrayed in the wrestling world in the near future? TG: I hope so. Speaking generally, wrestling characters are more complex today than they were twenty years ago, and I’ve no reason to think gay characters will develop any differently. I’m somewhat heartened that, last year, WWE fans turned Billy and Chuck into de facto babyfaces…although it’s important to note that that turn hinged on treating homosexual love as a joke, and a mean-spirited joke, at that. There’s plenty of room for improvement, and, hoping not too sound too messianic here, I’m doing what I can to create it. CG: You’ve gotten far more press than any other indy worker I can think of. What’s next on your plate? TG: What else? Governor of Minnesota, jack!